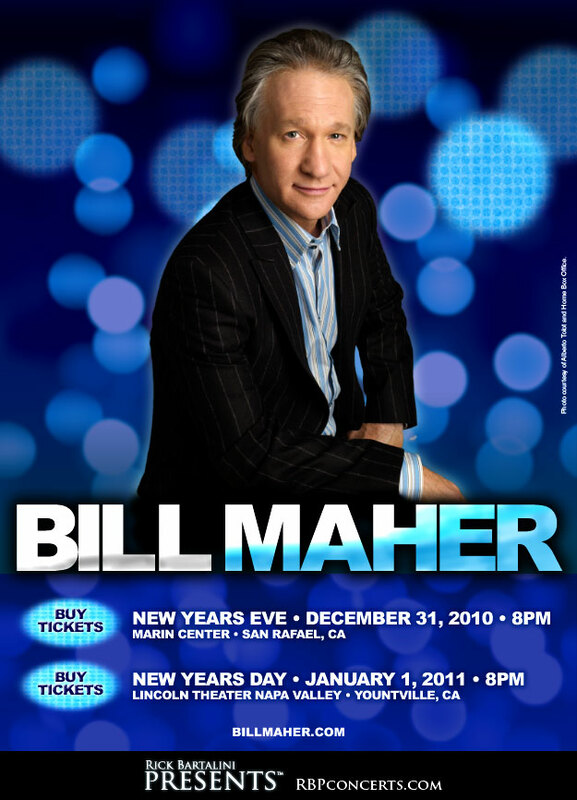 SANTA ROSA, Calif. (October 20, 2010) – Bill Maher, comedian and host of “Real Time” on HBO will perform two special Bay Area concerts on New Year’s Eve at the Marin Center in San Rafael and on New Year’s Day at the Lincoln Theater in Napa, announced Rick Bartalini Presents. The concerts will mark Maher’s first appearance in Marin County and the Napa Valley. Tickets for both performances go on sale this Saturday, October 23 at 10am. For the last fifteen years, Bill Maher has set the boundaries of where funny, political talk can go on American television. First on “Politically Incorrect” (Comedy Central, ABC, 1993-2002), and for the last seven years on HBO’s “Real Time,” Maher’s combination of unflinching honesty and big laughs have garnered him 21 Emmy nominations. In October 2008, this same combination was on display in Maher’s uproarious and unprecedented swipe at organized religion, “Religulous,” directed by Larry Charles (“Borat”). The documentary has gone on to become the seventh highest grossing documentary ever. Maher will appear Oct. 26 on TBS’s The George Lopez Show, Nov. 9 on MSNBC’s Countdown with Keith Olbermann and Dec. 16 on CNN’s Larry King Live. Tickets for the concerts Dec. 31 in Marin and Jan. 1 in Napa go on sale Saturday, October 23 at 10:00am. Rick Bartalini Presents, LLC, was founded in 2010 by Northern California-based Talent Buyer Rick Bartalini. Over the last decade, Bartalini booked over 350 concerts in Sonoma County, selling over 450,000 tickets with gross sales exceeding 25 million dollars.